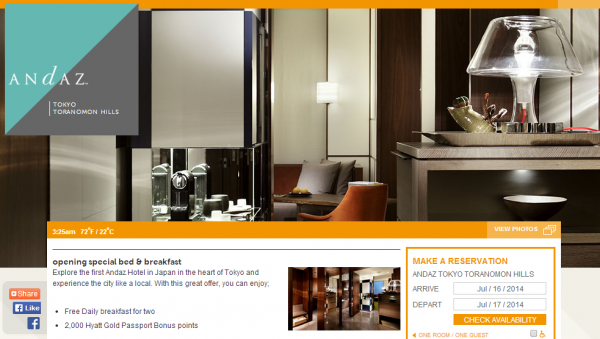 Andaz Tokyo Toranomon Hills is set to open on June 11 and the hotels has a 2,000 bonus points Bed & Breakfast rate loaded for stays until August 31, 2014. You must book a special “Opening Special B&B” using “Special Offer Code” TYAZ1, although the promo rate did come up on the rate search using other offer codes as well. It doesn’t make any sense for Hyatt Diamond members to book this rate over the My Elite rate and basically pay extra $79 for 2,000 bonus points. Diamond members are eligible for the breakfast anyway. Better opening offer would have been straight 2,000 bonus points on all eligible rates and not one tied to this Bed & Breakfast rate. The current rates for this properties seem sky high that is often the case with new properties that have very high daily rate aspirations. The rates tend to come down once the reality sinks in. 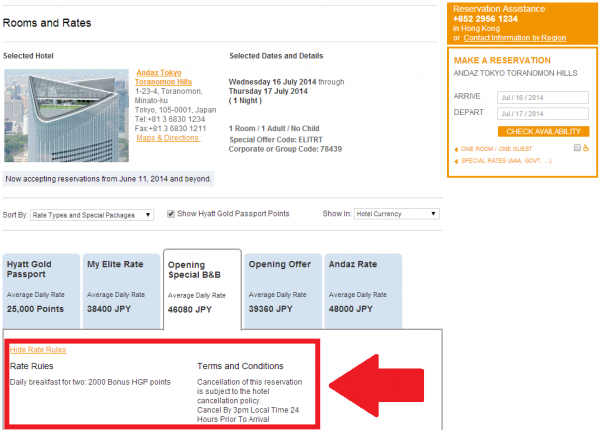 Offer valid until August 31, 2014 at Andaz Tokyo Toranomon Hills. Reservations are subject to availability and must be made in advance. Rate includes Daily Breakfast for 2 guests. To receive 2,000 Hyatt Gold Passport bonus points, you must be a Hyatt Gold Passport member, book the Opening Celebration Offer rate, request Offer Code TYAZ1 at time of booking and choose Hyatt Gold Passport points for their stay. Rate is per room, per night, excluding service charges, taxes and other incidental expenses. Rate is based on double occupancy and standard room accommodations. Additional guests may be subject to additional hotel charges. Additional charges apply to room-type upgrades. A limited number of rooms are allocated to this promotion.This promotion is subject to the complete terms and conditions of the Hyatt Gold Passport program. Please allow 6-8 weeks after travel is completed for Hyatt Gold Passport bonus points to be credited to your account.